Nummular meaning round or coin shaped dermatitis or eczema (NE) is an inflammatory skin condition characterized by the presence of well-demarcated round-to-oval erythematous plaques. The term nummular dermatitis has been used both as an independent disease and as a description of lesion morphology that can be found in many different diseases, including atopic dermatitis, contact dermatitis, and asteatotic eczema. Other names included discoid eczema or orbicular eczema. Discoid eczema is a quite common eczematous disorder of unknown cause, Nummular eczema reported in all age groups and in all body areas but is most commonly found on the upper and lower extremities. Lesions usually start as papules, which coalesce into plaques. They are usually scaly. Early lesions may be studded with vesicles containing serous exudate. Nummular eczema is usually very pruritic. Many precipitating factors have been reported, including dry skin, contact allergies, weather particularly winter, nutritional issues, and emotional stress. Slightly raised, pink-red, scaly discs, varying in diameter from 1 cm to 4 cm, appear on the arms and legs and, less frequently, on the trunk. The disorder is usually quite itchy and the skin on the arms and legs is often dry as well. No cause has been established but chronic stress is often present and likely multifactorial. Most patients with nummular eczema also have very dry (xerotic) skin. Local trauma, such as arthropod bites, contact with chemicals, or abrasions, may precede an outbreak. Contact dermatitis may play a role in some cases. Contact dermatitis may be irritant or allergic in nature. Sensitivity to nickel, cobalt, or chromates has been reported in patients with nummular dermatitis. The most frequent sensitizers were colophony, nitrofurazone, neomycin sulfate, and nickel sulfate. In the past, cases of nummular eczema–like eruptions have been caused by ethyl cyanoacrylate–containing glue, thimerosal,mercury-containing dental amalgams,and depilating creams containing potassium thioglycolate. Venous insufficiency and varicosities, stasis dermatitis, and edema may be related to involvement of the affected lower extremities. Autoeczematization (ie, lesional spread from the initial focal site) may account for the presence of multiple plaques. Onset of severe, generalized nummular lesions has been reported in association with interferon therapy for hepatitis C as well as exposure to mercury. 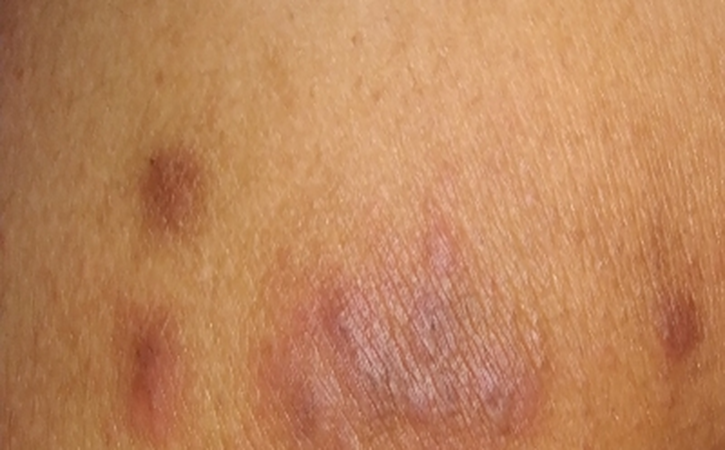 Various types of eczematous eruptions, including nummular eczema, have been observed following tumor necrosis factor-alpha–blocking therapy. Nummular eczema of the breast has reported in breast cancer patients undergoing mastectomy with subsequent breast reconstruction. Nummular eczema has been found in association with infection in rare cases. Giardiasis has been reported. Patients with Helicobacter pylori infection and nummular dermatitis, eradication of H pylori caused clearance of the skin lesions in around 54% of the patients. Also nummular eczema in association with a dental infection that cleared after the treatment of the infection. Nummular eczema treatment is aimed at rehydration of the skin and repair of the epidermal lipid barrier, reduction of inflammation and treatment of any infection. Lukewarm or cool baths or showers reduce itching and help rehydrate the skin. It worked as long as soap is not used and moisturizers are applied to wet skin. Patients should be instructed to bathe 1-2 times a day at least, followed by the application of moisturizers or medicated topical preparations, without drying off, to seal the water in the skin. The soak-and-smear therapeutic regimen includes a 20-minute plain water soak each night followed by application of steroid ointment or petrolatum to wet skin and includes alteration of cleansing habits so that soap is applied only to the axilla and groin. Wet wrap treatments are often helpful. Steroids are the most commonly used therapy to reduce inflammation. Steroid may be applied 2-4 times daily to the affected areas. Topical steroids are effective. Less erythematous, less pruritic lesions may be treated with low-potency steroids. 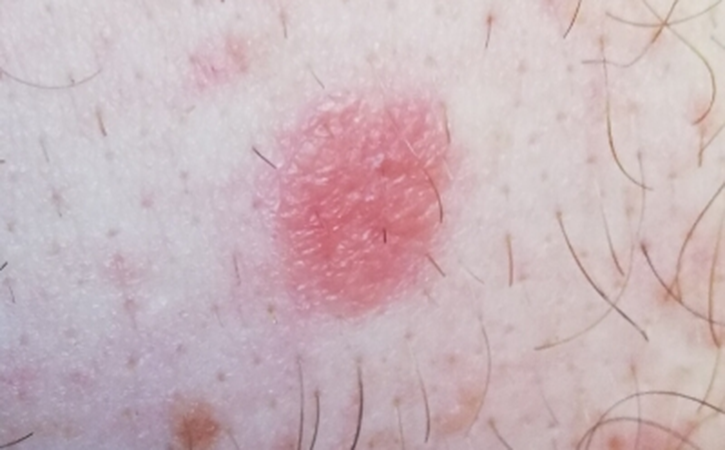 Severely inflamed lesions with intense erythema, vesicles, and pruritus require high-potency preparations. Penetration of the medication is enhanced by occlusion or presoaking in a tub of plain water followed immediately without drying by application of the steroid-containing ointment. Application of the medicine to damp skin allows more effective penetration and faster healing. Ointments are usually more effective than creams because they are more occlusive, form a barrier between the skin and the environment, and more effectively hold water into the skin. Emollients and topical steroids may be used for short term. Oral, intramuscular, or parenteral steroids may be required in cases of severe, generalized eruptions. Tar preparations are helpful to decrease inflammation, particularly in older, thickened, scaly plaques. Topical immune modulators (tacrolimus and pimecrolimus) also reduce inflammation. These are often initiated a few days after the topical steroid to decrease the risk of a burning sensation that may occur when applied to extremely irritated skin. When eruptions are generalized and prolonged, phototherapy (generally UVB) may be helpful. Broadband or narrow band UVB is most commonly used, although PUVA (Psoralen + UVA) may be used in severe cases. Oral antihistamines or sedatives may help reduce itching and improve sleep. Topical antihistamines are known to be potent topical sensitizers, and, thus, preparations containing topical diphenhydramine in particular should not be used. Topical antibiotics such as mupirocin may help impetiginization; as neomycin-containing medications are potent topical sensitizers, these should be avoided. Oral antibiotics, such as dicloxacillin, cephalexin, or erythromycin, should be used in cases of secondary infection. Swab cultures of the skin guide selection of antibiotics. Once the eruption has resolved, ongoing aggressive hydration may decrease the frequency between flares, particularly in dry climates. Heavy moisturizers or petroleum jelly applied to damp skin after showering may be helpful. Disease may be severe and refractory to the above treatments. Immune-suppressive medications such as methotrexate have been safe and effective in these severely affected patients. A combination of a topical antibiotic and a steroid ointment applied twice daily is usually very effective. This therapy decreases inflammation and colonization by staphylococci. Because lesions are persistent and may be difficult to treat, consultation with a dermatologist in an outpatient setting may be advisable.